The Garmin Forerunner 35 has a more edgy look than the Garmin Vivosmart HR+, with a slightly wider screen for messaging. With built-in Garmin Elevate wrist-based heart rate as well as GPS that tracks your distance, pace, intervals and more. And since all these stats are captured by the watch, your watch is all you need — no phone, no chest strap. 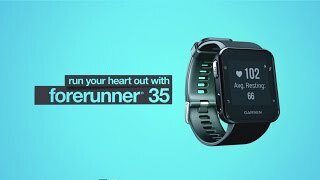 Just put on Forerunner 35 and go! When paired with your compatible smartphone, Forerunner 35 offers the convenience of smart notifications right on your wrist along with a variety of other connected features makes it easy to live and workout without one interrupting the other. Stay connected to friends with the live tracking feature, which lets them follow your activities in real time. Forerunner 35 also keeps you up to date with automatic software updates, and it allows for music controls and more on your device. GPS allows you to automatically upload your stats and runs to Garmin Connect, it also watches out for periods of inactivity and gives you vibration alerts when it's time to move. Brilliant training device to help reach your fitness goals!